I just happened to be on Twitter and saw Jenn searching for a not too scary scary book for her book club and she threw this one out as a suggestion. I am always looking for a new audiobook so I looked it up and decided to give it a shot. The world is ending but probably not as anyone expected. Instead, people are going crazy when they see something....driven completely mad and to deadly violence. They believe it' a creature, but the only way to survive is to not look at anything. Enter a young mother who has raised her two children in this post-sight world. She wants to travel to a potential new place, but the risk is high. 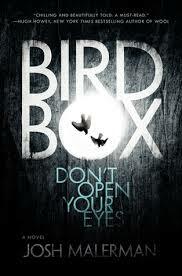 Bird Box is the story of that adventure and all the days that came before. I have a high tolerance for scary (generally I only get slightly creeped out and not really scared) and this book is better described as post-apocalyptic in my opinion. Also, the premise reminded me so much of M Night Shyamalan's The Happening that I had to look up if there was influence. Apparently, the author had the book before that movie was released but felt it might get lost in the shuffle at that time. Bird Box is much better anyway. It is in fact excellent. Such a unique premise and such a great way to play on fear. It is delightfully full of tension and anticipation. It's so interesting to think of adjusting to a world where no one can look at things and must use blindfolds and black out the windows indoors...and any break is a bit of danger. And Cassandra Campbell is a great narrator, she sounds like she knows what she's reading and uses all the best inflection and drama without over acting. I'm listening to another books she narrates right now and she's A+. So if you're looking for an exciting book with a little bit of creep factor and a whole lot of unknown, I recommend!